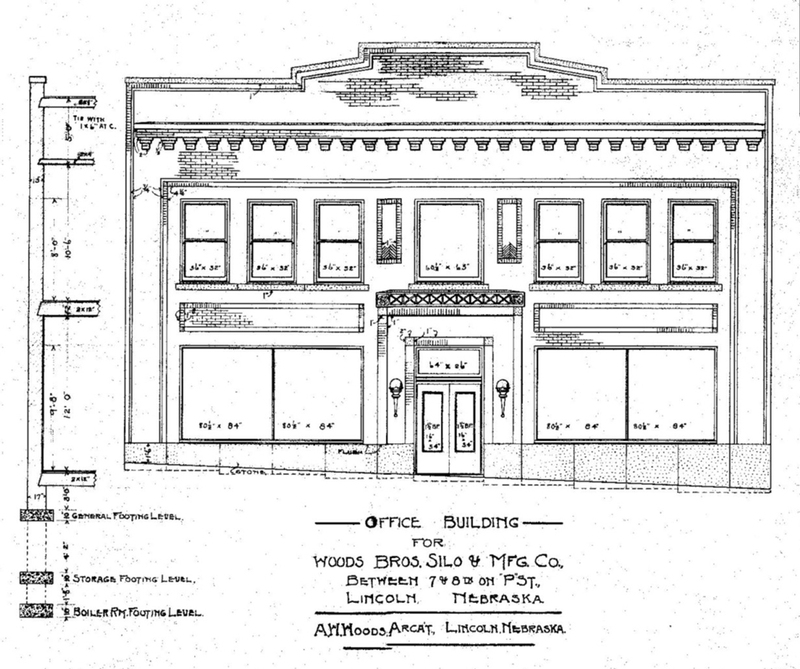 The Old Woods Brothers Companies Building was designed by Alfred W. Woods and built for an estimated $8,600. The architect and his clients, brothers Frank, Mark, and George Woods, were all natives of Illinois, but Alfred was apparently unrelated to the brothers. For four years the building was headquarters of the Woods Brothers’ several real estate and agricultural businesses. Among their diverse activities were silo building and stallion importing. In 1918, the Woods Brothers moved to a new, more elegant building on South 13th Street, in the center of the city's retail and financial district. The enterprises they founded, including not just extensive real estate developments but also Lincoln Telephone & Telegraph Company and Woods Aitken law firm, became central to the city’s commercial life. Back in the wholesale district, J. C. Ridnour Company, a dry goods wholesaler and work clothes manufacturer, acquired the Woods Bros. Building in 1918 and added another 67 feet to the south end, doubling its size. In 1925 Ridnour erected their own building at 821 P Street and left 719 P to a succession of manufacturing and warehousing concerns. While the north facade appears very simple at first glance, architect Woods designed complex patterns for the brickwork and highlighted them with stone accents. Compare the architect's drawing to the faithfully executed facade. The 1987 redevelopment of the building as the "Burkholder Project" helped catalyze the Haymarket through its “open-door” artists' studios, gallery spaces around a central atrium, and loft apartments, designed and developed by owner and artist Anne Burkholder. On the “First Friday” evening of every month, throngs of art lovers visit open houses at the art galleries in this building and throughout the Haymarket and downtown.